Observed in a maize field near Eldoret, Kenya, July 2014. Host plant is Maize. From Wikipedia: Grey leaf spot (GLS) is a foliar fungal disease that affects maize, also known as corn. There are two fungal pathogens that cause GLS, which are Cercospora zeae-maydis and Cercospora zeina. 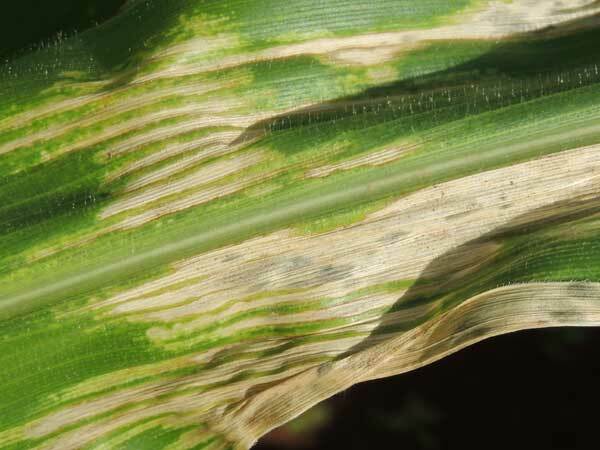 Symptoms seen on corn include leaf lesions, discoloration (chlorosis), and foliar blight. The fungus survives in debris of topsoil and infects healthy crop via asexual spores called conidia. Environmental conditions that best suit infection and growth include moist, humid, and warm climates. Poor airflow, low sunlight, overcrowding, improper soil nutrient and irrigation management, and poor soil drainage can all contribute to the propagation of the disease. Management techniques include crop resistance, crop rotation, residue management, use of fungicides, and weed control. The purpose of disease management is to prevent the amount of secondary disease cycles as well as to protect leaf area from damage prior to grain formation.